Tuesday I had meetings in the city. There would be walking, possibly some photos, I wanted to look casual yet polished. My go-to for such situations is jeans, a blazer, and an interesting pair of shoes. These are all wardrobe classics for me and have been for years. The silhouettes may change slightly as new trends hit the scene, but the concept remains the same and is always a great choice. Ann Taylor sent me this jacket with the matching pants and it made me realize I didn't have a classic black suit in my wardrobe. I have a Le Smoking, I have a casual blazer, but not a tailored piece that can go from day to night and work almost every month of the year. This fit great right out of the box; stay tuned I'll show it soon with the pants. But the fabric is the kind you can glam up with a silk cami and heels or wear with your favorite jeans. I wanted to keep it casual so I paired it with a simple ribbed tank. These jeans I saw online and thought… oh no honey. Then I saw people wear them on Instagram and was surprised by how much I liked them. 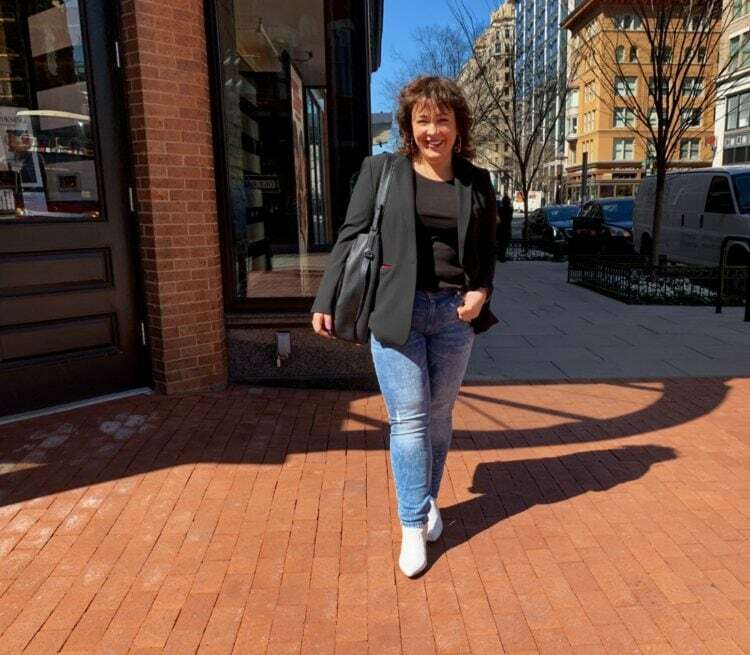 I did a campaign with cabi for International Women's Day and in thanks for participating they offered me an outfit and I asked for these jeans. They've become a pair I regularly wear, and I grabbed them for Tuesday not even planning on taking pictures for the blog (thanks to my husband, his awesome camera phone, a patch of sunlight and a moment where we had extra time and were trying what to decide what to do with it). They're comfortable and don't stretch out in the belly and rear area like many jeans. The wash and distressing feels very late '80s/early '90s but is subtle enough that I don't feel like a walking cliche, more that I have not-boring jeans. I bought these booties over a year ago. I never thought a pair of white ankle boots would get so much wear, but they're that unexpected pop for so many outfits (see them worn in this outfit post). And being Naturalizer, they're also quite comfortable! The earrings are hard to see, but they're the star of the look. I've admired DC-based jewelry designer Denisa Piatti's work for a long while and was honored to be in one of her campaigns last year. I finally reached out to her and commissioned a custom piece from her – a pair of hoops similar to these but much larger and shiny. I've worn hoops since middle school and wanted to celebrate the first year of going full-time with this blog. I'll be sharing some more behind the scenes about the creation of these hoops very soon! Love, love, love the Loire tank from Universal Standard. Hoping to snag some more at their Seattle sample sale this weekend. Hello, did you have the jeans shortened? I have a darker rinse pair of jeans from Cabi Fall ’18 that would work with a black jacket (also Cabi Fall ’18). Right now I am wearing them with a deep cuff because I’m 5’2″, and calling it good. Nope! I usually have to get cabi jeans shortened but these turned out a good length for me! Thanks as always for calling out by name the independent jewelry designers and makers you support! Jewelry is a form of art, and I love promoting artists, especially ones from the DC area! Denisa is so talented! Do you think boot cut jeans with a dark wash would be OK for this outfit? Bootcut jeans tend to look the best on me. I have a number of pairs of shoes that I think look good with this kind of outfit. Yes, it’s great how pretty much any cut of denim is now on trend. Bootcut is back, and I think would be a great choice if you love the cut! Before we relocated to Fl…this was my standard uniform. Jeans, black T and jacket. Cool shoes and glasses. So much harder in a warm/hot climate. You look professional with an edge!